Because today, we honor those who die, and those who live with lose, I wanted to share what I wrote when I was 14. Because freedom in never free, someone will have to pay the price. Because Freedom is never free, we need to be reminded of those who gave the ultimate price to protect it. Because freedom is never free, if some were not willing to give their all for it, it would die. Because freedom is never free, the people who protect it will always be in harm’s way. Because freedom is never free, there will always be struggles. Because freedom is never free, there will be wars with those who hate it. Because freedom is never free, our men and women in uniform will always be in danger. 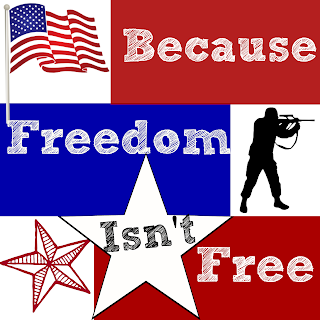 Because freedom is never free, we need police, sheriffs, and all the others in law enforcement to defend us. Because freedom is never free, veterans say they would fight again. Because freedom is never free, I thank all of those who serve to protect me now, and all those who gave the ultimate price in the past, because I know that FREEDOM IS NEVER FREE.